Perhaps you missed the media curve on this: Berkeley will vote, Nov. 6, to ban-sitting on walks in business districts. Berkeley has ten sizable business districts. Berkeleyans have been tearing at their chests over this since late last year, when the issue became a rallying cry among local radicals. The Med is at the eye of the hurricane. 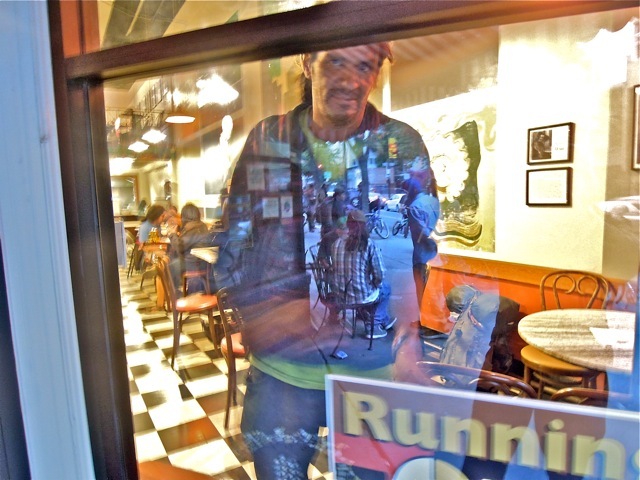 Running Wolf, shadow candidate for Berkeley Mayor kicks off his campaign at Cafe Mediterraneum last week. Craig Becker, a personal friend of RW's, asked him to take his sign out of the Med window next to the Dustin Hoffman table.